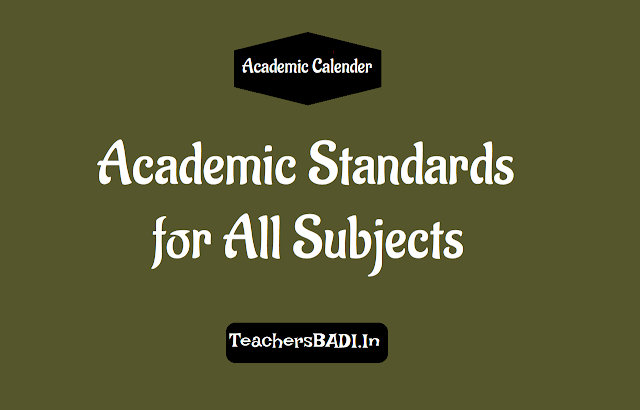 Academic Standards for All Subjects: The new textbooks in all subjects have been developed basing on National Curriculum Framework (NCF) 2005 and State Curriculum Framework (SCF) 2011 and they are in tune with Right To Education Act (RTE) 2009. They envisage a shift in the teaching paradigm in the sense that the focus is on knowledge and language construction rather than the reproduction of a given set of information. All textbooks have been developed keeping the following as the learning outcomes expected from the learners at the end of the academic year. Academic Standards: At the end of the academic year the children are expected to achieve certain academic standards. The everyday classroom transaction should ensure the achievement of the academic standards among children. The following are the Subject wise Academic Standards. 3. Individual values- Compassion, empathy, honesty etc.